After the free trial, Apple will split the revenue 70/30—the streaming industry standard. Now we know why those negotiations between Apple and the record labels went until the 11th hour before Apple Music’s big unveiling at WWDC last week. According to Re/code, Apple has negotiated not to pay record labels for streaming their catalogs during the three-month free trial Apple Music is offering all new customers. After the three months, an Apple Music subscription will cost $10 a month, and record labels will receive about 71.5 percent of the U.S. revenue. 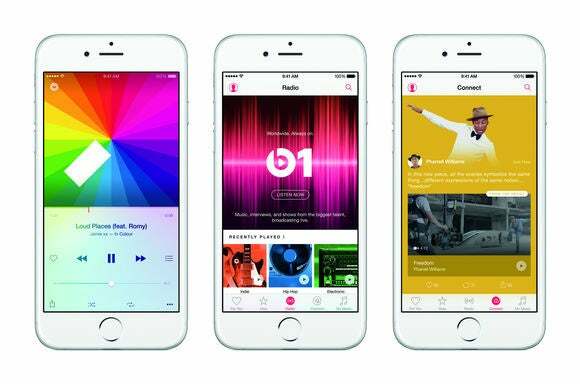 Outside the U.S., Apple Music will pay out a slightly higher figure: 73 percent, although that’s likely to fluctuate. Apple’s VP of iTunes content, Robert Kondrk, revealed the exact figures after reports surfaced last week that Apple Music would only pay 58 percent back to the music industry for streaming their catalogs. Kondrk helped Apple’s media head Eddy Cue negotiate with the music labels for the new streaming service launching on June 30. We previously reported that Apple was adamant about offering a free trial period and other “freemium” alternatives to lure listeners. Apparently, these options were nonnegotiable: Apple Music will give listeners three months of free streaming and also include a bevy of free radio stations. While the 70/30 revenue split is somewhat industry standard for streaming services and record labels (Spotify and Rdio offer almost the same splits), Apple Music’s three-month free trial is practically unheard of. Previously, Beats Music offered a one-month free trial. Google Play Music All Access currently has a 30-day free trial, too, while Spotify offers new customers three months of premium subscription for $1. A Spotify spokesperson, Jonathan Prince, told Re/dode that Spotify pays record labels for every stream on its platform, even if it’s streamed during a free trial or on Spotify’s ad-supported free tier. That may not be the case on songs that are streamed on Apple Music’s free radio stations. “We pay royalties on every single listen, including trial offers and our mobile free custom radio service, and that adds up to approximately 70 percent of our total revenues, as it always has,” said Prince. Why this matters: The free trial will certainly lure a lot of curious listeners, and Apple is hoping that by offering a lengthy free trials, listeners will become more invested in Apple Music: building playlists, following artists, falling in love with Zane Lowe’s voice on Beats 1 radio. It’s a leap of faith for both Apple and the record labels (which will be getting zilch during the three-month free trial). But knowing that the trial will expire could also make streaming-savvy listeners more hesitant to go all-in on Apple Music. And the only thing they’ll end up committing to is canceling their recurring membership before it charges them $10.